This complaint gave me some pause, so I decided to search the web for any other mentions of this recipe. I found several and one in particular had considerable success. I also found a video of Nigella making the dish and discovered that she used the jelly as a condiment and not as part of a sauce. 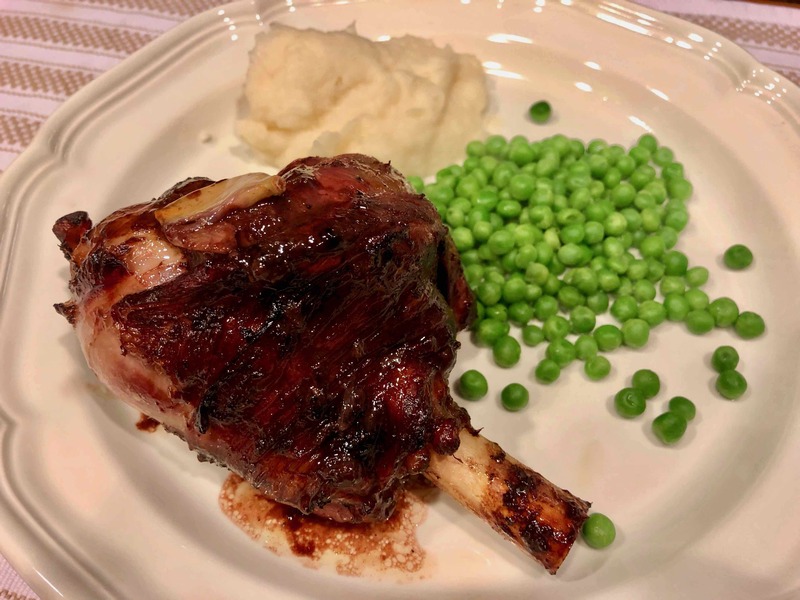 Even more research led me to different methods of roasting lamb shanks, many of which called for slow cooking them either covered or wrapped in foil packages. Although I was tempted to follow one of them, in the end I stuck to the original. To avoid a sticky mess, I used a non-stick “everyday” pan for my roasting tin and made sure to use the baking level of my oven, which would provide more even heating. I also planned to add a little wine to the pan if it looked as though the sauce was drying up. Should you decide to make one one shank, I’d advise keeping the doubled marinade. Also keep in mind that, unlike a roast leg of lamb, a shank cannot be served rare. 1. Put everything together, along with squeezed lemon halves, into a freezer bag, tie securely, and leave in the refrigerator to marinate overnight. 3. Take the lamb in its package out of the fridge to come to room temperature. 4. 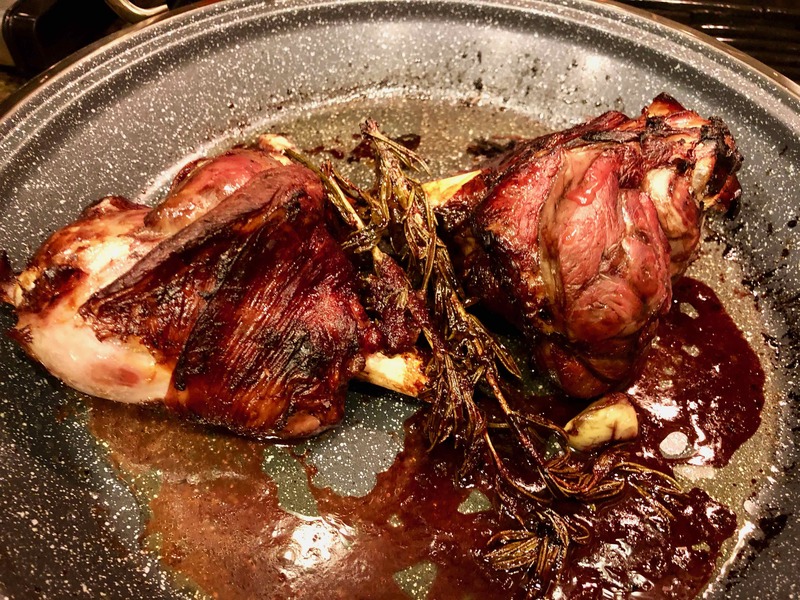 Put the lamb shank along with its marinade (minus the lemon halves) into a roasting tin and cook for 1 to 1 1/2 hours, depending on the size of the shank. Turn the shank over halfway through cooking. Add a splash or two of wine to the pan if necessary. 5. By the time it is done it should look bursting with bronze color; remove from the pan and let stand 5 to 10 minutes before serving. 6. Serve the lamb shanks whole and drizzle with gravy.